If you’re looking for a BCAA supplement which goes above and beyond the call of duty, EVLUTION NUTRITION BCAA LEAN ENERGY should fit the bill nicely. This BCAA product has one of the most versatile formulations we’ve seen to date, as you’ll find out in this review. Smart formulation. Has thermogenic, aphrodisiac, and nootropic properties. . Impressive doses of vitamin C, vitamin B12, and vitamin B6. Additional health benefits galore. Awesome taste. One of the better-tasting BCAA supplements on the market today. Other Ingredients: Malic Acid, Natural and Artificial Flavor, Citric Acid, Sucralose, Silica, Acesulfame Potassium, FD&C Red #40. Directions: As a dietary supplement, mix 2 scoops of BCAA LEAN ENERGY™ in 8-10 oz. of cold water (vary amount of water by taste preference). We hope you’ve checked out our BCAA supplement reviews here on B5. We’re sure you’ll stumble upon some top-notch bodybuilding products in this category. Branched-chain (BCAA) supplements are among the most versatile in the industry. You can take them any time and anywhere. They help you remain in an anabolic state in and out of the gym. Now, that’s impressive. Plus, BCAAs are essential amino acids. This means your body cannot synthesize them – you must obtain them from whole foods and supplements. True, whole-food sources such as chicken breast are an excellent source of BCAAs. However, BCAA supplements are not only more convenient, but they also provide you with other ingredients which help give you an edge. One such product is EVLUTION NUTRITION BCAA ENERGY. We love its five grams of BCAAs per serving, 2.5 grams of l-leucine per serving, and mega doses of vitamin B (500 percent of the daily value each for vitamin B6 and vitamin B12) and vitamin C (150 percent of the daily value). However, we weren’t enamored with its filler content. Let’s see if EVLUTION NUTRITION BCAA LEAN ENERGY can exceed your expectations. The manufacturer dubs it “The Evolution of Energized Amino Acids,” per its official website. 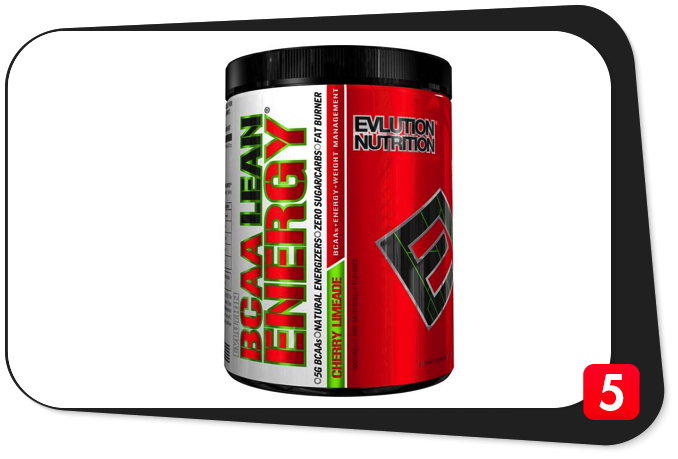 EVLUTION NUTRITION BCAA LEAN ENERGY is sure to ramp up your energy levels in and out of the gym. This product is strikingly similar to EVLUTION NUTRITION BCAA ENERGY. However, a few key ingredients (conjugated linoleic acid and acetyl-l-carnitine, and maca powder) make EVLUTION NUTRITION BCAA LEAN ENERGY an advanced formulation of its predecessor. We get the impression EVLUTION NUTRITION BCAA LEAN ENERGY will help you achieve your fitness goals and then some. Let’s hope it sets the bar high. Leading the charge for EVLUTION NUTRITION BCAA LEAN ENERGY are the three BCAAs, which take up five grams per serving. This supplement follows a 2:1:1 BCAA ratio – the most common among BCAA products. At the forefront are 2.5 grams of l-leucine per two-scoop serving. Bear in mind this is the most anabolic amino acid which helps kickstart the muscle protein synthesis process. The good news: leucine isn’t just about muscle-building. Experts also believe it helps preserve muscle mass, boost fat loss, and ward off inflammation. The takeaway: leucine is more than just a muscle-builder. EVLUTION NUTRITION BCAA LEAN ENERGY’s 2.5 grams of leucine per serving should suffice. We’re confident it’ll go a long way. This product also has 1.25 grams each of l-isoleucine and l-valine, two BCAAs which help increase endurance and repair muscle tissue. Plus, the former helps regulate blood sugar levels, produce protein for the body, play a key role in blood clot formation, and maintain a positive nitrogen balance. As for the latter, it helps maintain muscle mass, regulate the immune system, improve sleep quality, and quell anxiety. EVLUTION NUTRITION BCAA LEAN ENERGY’s 2:1:1 BCAA Matrix shows nothing out of the ordinary – it’s your usual BCAA content which follows the traditional 2:1:1 BCAA ratio. Don’t take it the wrong way, though: this formulation may be common, but it will still make a difference. It’s pretty obvious EVLUTION NUTRITION BCAA LEAN ENERGY’s 2:1:1 BCAA Matrix is just the proverbial tip of the iceberg – its BCAA Energy Lean Matrix contains the key ingredients which sets it apart from the rest of the field. The dominant ingredient here is conjugated linoleic acid (CLA), which takes up one gram per two-scoop serving. Long story short, this ingredient is related to omega-6 fatty acids, which help boost metabolism, promote healthy cholesterol levels, and regulate immunity. As for us, we’re stoked EVLUTION NUTRITION BCAA LEAN ENERGY has CLA. It will make a tremendous impact on your lifestyle. Next up are 500 milligrams of acetyl-l-carnitine per serving. This is a processed form of the fat-burning amino acid l-carnitine which helps enhance cognitive function, increase energy levels, regulate muscle movement, and boost heart health. A key advantage of acetyl-l-carnitine is its ability to pass the blood-brain barrier fairly easily. That means you’ll be able to feel its energy-boosting effects sooner than later. One thing’s for sure: acetyl-l-carnitine is not a common ingredient among BCAA supplements. We’re glad it’s in EVLUTION NUTRITION BCAA LEAN ENERGY. The third component of the BCAA Energy Lean Matrix is maca powder, which is equal to 100 milligrams per serving. This is an ancient root crop and superfood from Peru which you can also find in testosterone boosters such as Mutant Test, Alpha King, and MAX’s Lab Series The Gear. Not only that, but maca root also helps increase endurance, boost memory, and keep free radicals at bay. The key takeaway: EVLUTION NUTRITION BCAA LEAN ENERGY’s maca root component makes it a BCAA supplement which can double as an aphrodisiac. That bodes well for your overall health. 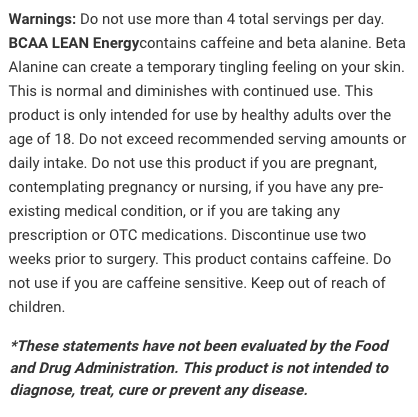 Now, if you think the BCAA and the acetyl-l-carnitine components aren’t enough to get you out of your slump, 500 milligrams of CarnoSyn beta-alanine per serving should do the trick. 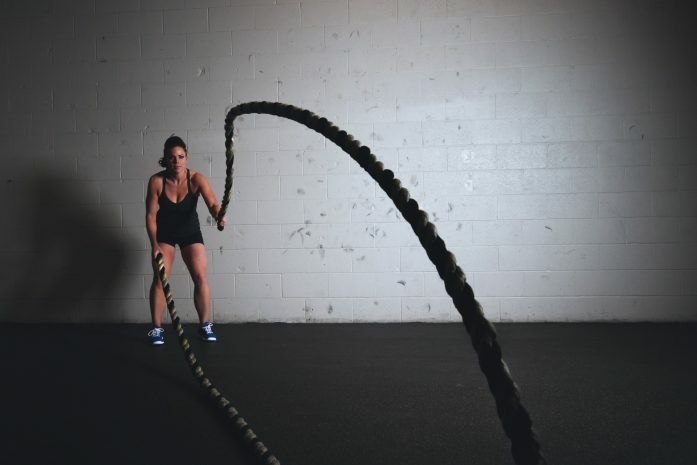 Beta-alanine is a naturally-occurring beta amino acid which helps buffer muscle carnosine levels. This, in turn, helps increase endurance and keep fatigue at bay. You’ll be able to work out longer and harder, for sure. No wonder you can find beta-alanine in many pre-workout supplements. It’s a time-tested bodybuilding supplement ingredient. We give it a solid thumbs up. The next component of the BCAA Energy Lean Matrix is l-alanine, which takes up 500 milligrams per serving. To simplify matters, this amino acid helps convert glucose into energy. It also helps increase protection against cellular damage which may occur during intense aerobic exercise. L-alanine is a rare BCAA supplement ingredient. Since BCAAs help ramp up energy levels, it’s easy to figure out the manufacturer included l-alanine in EVLUTION NUTRITION BCAA LEAN ENERGY to complement this health benefit. Here’s the good news: a one-two punch of BCAAs and taurine will do wonders for your recovery time. According to the November 6, 2013 issue of the Journal of the International Society of Sports Nutrition, “A combination of 3.2 grams of BCAAs and 2.0 grams of taurine, three times a day, two weeks prior to, and three days after exercise attenuates some subjective and objective markers of DOMS (delayed onset muscle soreness) and muscle damage induced by high-intensity ECC (eccentric exercise). Well, it sure seems to us EVLUTION NUTRITION BCAA LEAN ENERGY’s five grams of BCAAs per serving is up to the daunting task. Unfortunately, 500 milligrams of taurine per serving may not cut it in this regard. Still, we cannot deny this amino acid’s invaluable benefits for the body. Take the BCAA Energy Lean Matrix for what it means: it will help ramp up your energy levels. Plus, it also has other benefits which should help shore up your long-term health. EVLUTION NUTRITION BCAA LEAN ENERGY’s Natural Energizers blend features a combined 110 milligrams of natural caffeine (from coffee bean) and green tea extract (standardized for EGCG)(leaf) per serving. Nonetheless, caffeine is also a bona fide double-edged sword: it may produce a spike-crash effect, increase anxiety, and induce sleeplessness, in some individuals. Always proceed with caution. As for green tea, it’s one of the world’s healthiest beverages: it helps boost brain health, increases fat loss, ward off free radicals, improve dental health, regulate blood sugar levels, and promote a healthy heart. We have no qualms about its inclusion in EVLUTION NUTRITION BCAA LEAN ENERGY. Caffeine and green tea make for a great combination in perking you up. That’s exactly what the Natural Energizers blend will do. A 110-milligram serving shouldn’t wreak havoc (in fact, that much is roughly equal to just one cup of brewed coffee) on your body. What we don’t like is the transparency: the manufacturer doesn’t break down the individual ingredient amounts of this product’s natural caffeine and green tea extract components. That doesn’t bode well for the customer at all. Nevertheless, EVLUTION NUTRITION BCAA LEAN ENERGY’s impressive formulation should help ramp up your energy levels, and then some. It may not be a perfect BCAA supplement, but its’ still solid in more ways than one. Vitamin C, 90 mg: EVLUTION NUTRITION BCAA LEAN ENERGY is an excellent source of vitamin C at a solid 150 percent of the daily value (a minimum daily value of 15 percent is high). This vitamin helps ward off the common cold, improve vision, ward off free radicals, regulate blood vessel function, promote healthy blood pressure levels, and boost cardiovascular health. Vitamin B12 (as methylcobalamin), 30 mcg: This BCAA supplement is a tremendous source of vitamin B12 at an astonishing 500 percent of the daily value (in fact, its vitamin B12 content can trump those of some multivitamins). This vitamin helps keep free radicals at bay, increase energy levels, improve cardiovascular function, form and maintain red blood cells, and regulate immunity. Vitamin B6 (as pyridoxine HCl), 10 mg: EVLUTION NUTRITION BCAA LEAN ENERGY is also an excellent source of vitamin B6 at an insane 500 percent of the daily value. This vitamin helps regulate cardiovascular, nervous system, immune system, and renal function; maintain healthy hormone levels in the body, and keep homocysteine levels (a non-protein amino acid detrimental to heart health) in check. L-leucine, 2,500 mg: The most anabolic amino acid which helps kickstart the muscle protein synthesis process. Leucine also helps preserve muscle mass, keep inflammation at bay, and boost fat loss. L-isoleucine, 1,250 mg: The BCAA which helps increase endurance, repair muscle tissue, regulate blood sugar levels, play a key role in blood clot formation, and maintain a positive nitrogen balance. L-valine, 1,250 mg: The BCAA which helps increase endurance, repair muscle tissue, maintain muscle mass, regulate immunity, improve sleep quality, and keep anxiety at bay. CLA (conjugated linoleic acid) powder (std. min. 60 percent CLA), 1,000 mg: A component related to omega-6 fatty acids which helps increase metabolism, boost immunity, and promote healthy cholesterol levels. Acetyl-l-carnitine, 500 mg: A form of l-carnitine which helps boost brain function, improve heart health, increase energy levels, and regulate muscle movement. Maca powder, 100 mg: An ancient root crop which helps enhance sexual function, ramp up endurance, boost memory, and ward off free radicals. CarnoSyn Beta-Alanine, 500 mg: A naturally-occurring beta amino acid which helps buffer muscle carnosine levels for increased work capacity and endurance. Long story short, beta-alanine allows you to work out longer and harder. L-alanine, 500 mg: An amino acid which helps convert glucose into energy and ward off cellular damage. Taurine, 500 mg: A versatile amino acid which helps increase fat loss, improve insulin sensitivity, increase testosterone levels, ward off oxidative stress, shorten recovery time, boost heart health, improve sleep quality, and enhance cognitive function. Natural caffeine (from coffee bean): Arguably the world’s most popular stimulant, caffeine helps increase longevity and energy levels, ward off free radicals, regulate blood sugar levels, improve liver function and physical performance, and boost fat loss. Caffeine may also produce a spike-crash effect, jitters, nervousness, and sleeplessness in some individuals. Green tea extract (standardized for EGCG)(leaf): A beverage which helps enhance cognitive and cardiovascular function, boost brain health and fat loss, keep free radicals at bay, and promote healthy blood sugar levels. First off, EVLUTION NUTRITION BCAA LEAN ENERGY’s five grams of branched-chain amino acids (BCAAs) per two-scoop serving on a 2:1:1 BCAA ratio are fairly typical – you can find this amount in many BCAA supplements. Nothing new here. With that, we’re confident 2.5 grams of leucine and 1.25 grams each of isoleucine and valine will do the trick. Like we said, the BCAA ENERGY LEAN MATRIX sets the bar high. We love the combination of CLA, acetyl-l-carnitine, maca powder, CarnoSyn Beta-Alanine, l-alanine, and taurine. You won’t find this unique combo in other BCAA supplements. These components will help boost fat loss and energy levels, regulate immunity, enhance cognitive and sexual function, increase exercise capacity, ramp up testosterone levels, and improve sleep quality and heart health, among other things. You won’t be able to say the same thing about other BCAA products. It sure seems to us EVLUTION NUTRITION BCAA LEAN ENERGY is one of the few in its category which can function as a nootropic, thermogenic, and aphrodisiac. This is one versatile supplement – it covers many bases. Throw in the Natural Energizers blend, EVLUTION NUTRITION BCAA LEAN ENERGY is sure to perk you up. The one-two punch of natural caffeine (from coffee bean) and green tea extract is not uncommon among BCAA supplements. Nonetheless, these two ingredients should get you going. A combined 110 milligrams per serving doesn’t go overboard. However, if you’re sensitive to caffeine, better skip this product. You also can’t go wrong with impressive amounts of vitamin C (150 percent of the daily value), vitamin B12 (500 percent of the daily value), and vitamin B6 (500 percent of the daily value). These should provide you with increased antioxidant protection and energy levels. We’re 100 percent certain they will deliver the goods. Customers have been raving about EVLUTION NUTRITION BCAA LEAN ENERGY’s impressive formulation. They say it works and helps them acheive their fitness goals. Plus, it tastes great. We second the motion. On the flip side, this BCAA product is by no means perfect. Its first glaring flaw is the proprietary nature of the Natural Energizers blend – the manufacturer didn’t break down the ingredient amounts of the natural caffeine and green tea extract components. Finally, EVLUTION NUTRITION BCAA LEAN ENERGY’s Cherry Limeade flavor contains two fillers: the artificial sweetener sucralose (a.k.a. Splenda) and the artificial food coloring FD&C Red No. 40. We say stevia (a natural sweetener which helps regulate blood sugar and blood pressure levels) would have been the better option. Nonetheless, EVLUTION NUTRITION BCAA LEAN ENERGY is a top-notch BCAA product which deserves a spot on your supplement stack. We’re clamoring for a cleaner formula from the manufacturer sooner than later. We agree with most of these. EVLUTION NUTRITION BCAA LEAN ENERGY is a top-notch BCAA supplement in more ways than one. EVLUTION NUTRITION BCAA LEAN ENERGY is for “fitness enthusiasts and athletes,” per its official website. EVLUTION NUTRITION BCAA LEAN ENERGY contains 500 milligrams of CarnoSyn Beta-Alanine, which may cause the so-called “beta-alanine itch”(a harmless flushing sensation one feels shortly after consuming it). This product also contains natural caffeine (from coffee bean), which may cause a spike-crash effect, jitters, nervousness, and sleeplessness in some individuals. EVLUTION NUTRITION BCAA LEAN ENERGY also has sucralose, an artificial sweetener which experts have linked to obesity and the like. Finally, this supplement’s Cherry Limeade flavor contains FD&C Red No. 40, an artificial sweetener which has links to carcinogenicity. Smart formulation. Simply put, it’s more than just a BCAA supplement. Versatile. Also acts as a thermogenic, nootropic, and aphrodisiac. Five grams of BCAAs per serving. The standard amount for BCAA products. Impressive amounts of vitamin C, vitamin B6, and vitamin B12. Additional health benefits galore. Great reputation. Customers have sung its praises. Awesome taste. Easy on the taste buds, to say the least. Flavor options. Comes in Fruit Punch, Cherry Limeade, and Blue Raz flavors. Natural Energizers blend. Proprietary in nature. Fillers. Cherry Limeade flavor contains sucralose and FD&C Red No. 40. Caffeine content. We said it before, we’ll say it again: caffeine is a bona fide double-edged sword. If you’ve always wanted a BCAA supplement which goes the extra mile, EVLUTION NUTRITION BCAA LEAN ENERGY should be right up your alley: its impressive formulation is truly a cut above the rest. We’re confident this product will help you achieve your fitness goals. It may not be a perfect product, but it’s still worth buying. We recommend you get one and reap its benefits today. Once again, we’re clamoring for a cleaner formula sooner than later.